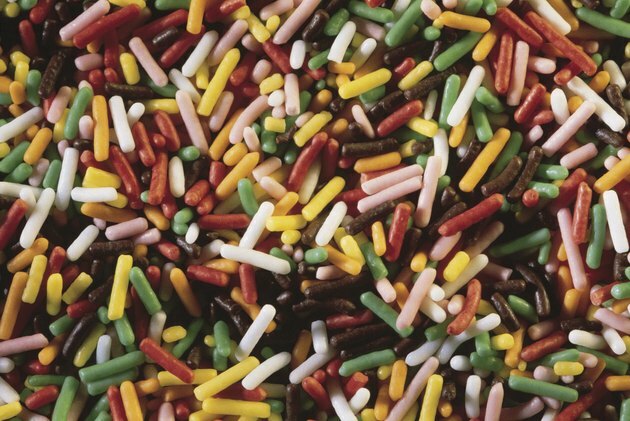 The name "sprinkles" generally refers to oblong nonpareils. Sugary sweet and hard, sprinkles are primarily decorative. Many desserts receive a sprinkling of "jimmies" after baking. However, unless the the baked goods are frosted, the sprinkles usually fall off. If you dust the top of brownie batter with sprinkles just before baking, the sprinkles slightly sink into the batter and remain in position after baking. Alternatively, incorporate sprinkles with wet batter to include them in the brownie's center. Set the oven temperature according to your brownie recipe's guidelines, usually 350 to 400 degrees Fahrenheit. Turn on the oven to preheat. Pour sprinkles to taste into the prepared brownie batter. Fold the sprinkles into the batter with a kitchen spatula. Pour the batter mixture into a greased baking dish. Place the dish in the oven and bake according to your recipe's guidelines, usually 45 to 60 minutes. Remove the brownies from the oven and cool before serving. Pour brownie batter into a greased baking dish. Pinch several sprinkles between your thumb and index finger and lightly distribute the sprinkles across the top of the wet batter. If your sprinkles are in shaker bottle, shake the sprinkles across the wet batter. Immediately place the brownie batter in the oven. Bake the brownies according to your recipe's guidelines and allow them to cool before serving. Preheat the oven according to your brownie batter recipe. Pour the batter into a greased dish, place the dish in the oven and cook according to the recipe's specifications. Remove the brownies from the oven. Allow them to fully cool; this means that both the surface and center of the brownies are cool. Spread frosting across the top surface of the brownies with a kitchen spatula. Pinch sprinkles between your fingers and lightly distribute them across the frosting. If your sprinkles are in a shaker bottle, shake the sprinkles across the frosting. Grind the sprinkles into a fine powder for a colorful, sweet dust. Dust frosted or plain brownies with the powder.